For nearly 3.6 million teens across the country, the most pressing addiction issue isn’t to illicit drugs, alcohol, or social media; it’s nicotine. Anti-cigarette campaigns throughout the 2010s managed to bring teen smoking to record lows. Yet, ahead of a planned release of study results, the U.S. Surgeon General revealed that nicotine abuse has skyrocketed in recent years. 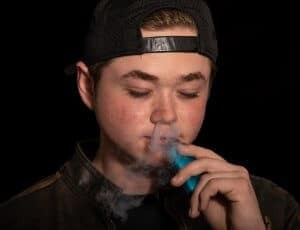 E-cigarettes and vaping devices–named for the process of heating liquid until it vaporizes–are used by 20.8% of high schoolers, an 80% increase from the year before. Between 2011 and 2015, use increased by more than 900%. Teens that vape are doing so more frequently than they did in previous years. Of current vapers, over a quarter vaped 20 of the last 30 days. For years, public health organizations fought to reduce the amount of exposure teens had to tobacco product marketing. Studies have shown that the more tobacco advertising an individual in their formative years was subjected to, the more likely they were to start smoking. Almost 9 of 10 smokers started before 18; 98% started by 26. Each month, one in five students vape regularly (a 78% increase among high schoolers from last year). One in 20 students have reported vaping marijuana. Between 2011 and 2015, e-cigarette use climbed 900% among high school students. In the summer of 2018, the FDA cracked down on over 1,300 retailers that had illegally sold vaping products to minors. Teens who use e-cigarettes are 30.7% more likely to start smoking cigarettes within 6 months. While not all e-cigarettes contain nicotine (found naturally in tobacco), the majority do. Nicotine can stunt the brain’s growth, especially if consumed before it’s fully grown around the age of 25. The addictive chemical also changes the way certain brain pathways develop, affecting areas responsible for attention span and learning ability. Nicotine addiction may not be life-threatening in the short-term but can cut an individual’s life by 10+ years with long-term use. Fortunately, recovering from an addiction to vaping and e-cigarette use can be managed with the help of a primary care provider and a system of support. For many teens, treating underlying mental health issues (like anxiety or depression) can help with substance use disorders as well. If you’re interested in more information about addiction treatment, contact a recovery specialist today.